Though it broke ground as the first Asian American-led musical on Broadway in more than a decade, George Takei’s Allegiance never quite found a steady audience and wound up closing after five months of performances. But now the musical is getting a second life with a special one-night only screening in movie theaters nationwide. 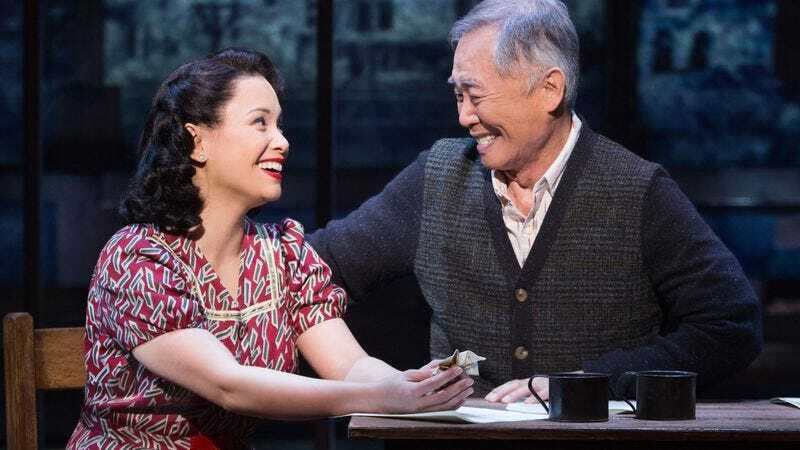 According to BroadwayWorld, “George Takei’s Allegiance: The Broadway Musical On The Big Screen” will be broadcast in theaters on Tuesday, December 13. The screening will include an intro from Takei, interviews with the cast and creators, and behind-the-scenes footage. Taking inspiration from Takei’s own life, Allegiance explores the U.S. internment of Japanese-Americans during World War II. Takei stars as the kooky grandfather of the Kimura family, who are forced to relocate from their California farm to an internment camp in Wyoming. The A.V. Club found it quietly revolutionary in its commitment to shifting the historical lens, if a little generic in its style. Allegiance has been a passion project from the beginning. This deeply moving story based on my family’s experiences could not be more timely, or poignant, considering the current political climate. So many people around the globe have never heard about this dark part of our nation’s history, and it is an honor and privilege for me to help tell this story, so that we can avoid repeating the mistakes of the past. The movie theater broadcast will feature the show’s entire original cast, including Telly Leung, Tony-winner Lea Salonga, and scene-stealer Michael K. Lee. Tickets for the broadcast go on sale November 11 and can be purchased via Fathom Events. Meanwhile, the show’s cast recording is currently available for both download and streaming.